Don’t Be Scared of Bone Broth! 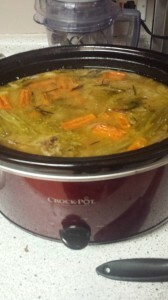 I will admit everything I have learned about bone broth I learned from Stacy Toth @ paleoparents.com. Here is the bone broth show if you want to listen more of the benefits and such of bone broth. Otherwise read on to how I made mine and what I have made with it! First things first. As a trained chef I was curious to know what the heck was the difference between making bone broth and making stock. I have made stock countless times and figured why is this such a big deal? The difference is the amount of time taken to make bone broth. Stock is just a few hours and bone broth requires a buttload of time! Yes that is a measurement of time indeed. Normally with stocks I would use the bones and carcasses of stuff I was cooking with and didn’t need for the recipe. With bone broth I learned from The Paleo View that using feet tends to be the best and most nutrient dense..so that is what I got! 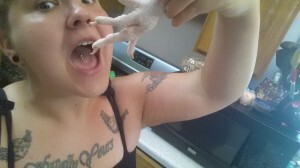 I felt like the weird lady at the store who bought feet..
For my first bone broth I did chicken feet and trotters (pigs feet). I was a bit nervous about leaving a pot on the stove while I was sleeping so I did the crock pot method. I added the feet to the crock pot and just filled the rest with water. I cooked the broth overnight and while I was at work. When there was maybe 4 hours left of cooking time I added my onions, carrots, veggies and fresh herbs. I used thyme and rosemary. I strained out the stock and disposed of the bones and smooshy vegetables. I know there’s things that can be done with bones..however I am not at ‘that’ level of Paleo. Haha. I will admit my first response to having bone broth was not what I expected. I figured with all the time it took to cook this stock it would have the most amazing chicken flavor known to all mankind! When I tasted it I was stunned to find it a little bland. Then I remembered in the book “It Starts With Food” it explains how the problem with processed foods is that it creates flavors that don’t exist in nature. I was expecting that crazy chicken flavor you get from processed bases and bouillon. Once I got over that I was in love. I realized how nutritious this was for me and all the health benefits this nutrient packed soup would provide. No processed junk. This was my second bone broth attempt with beef instead. I used cows feet and trotters again and the same veg and herbs. I made my own little version of Italian Wedding Soup…Amazeballs. Saute vegetables in olive oil until browned, a little bit further than just a sweat. Brown sausage in another pan, it is okay for them to be a little bit pink in the middle since it will continue to cook in the soup. Add broth and tomato product to the vegetables and stir. Bring to a boil and let simmer for about 1 hr. Add meatballs and let them finish cooking about 10-15 min. Serve! Delish! 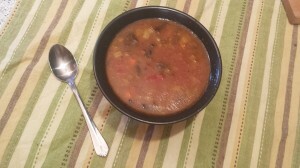 I am now hooked on bone broth and make a new soup just about every week. I even keep a jar handy in the fridge for when I need some extra broth for vegetables or making cauliflower rice.